TO CHEW ON: "But he, being full of the Holy Spirit, gazed into heaven and saw the glory of God and Jesus standing at the right hand of God and said, 'Look! I see the heavens opened and the Son of Man standing at the right hand of God!'" 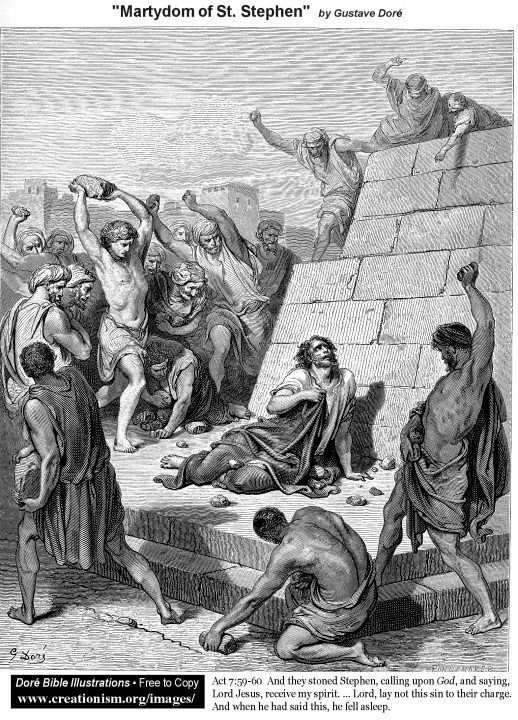 Acts 7:55-56.
Who would imagine that a wise, compassionate young man whose job it was to oversee the distribution of food to widows would become a martyr. Yet that was Stephen's fate. Today's reading is the story of his surprising death. It happens because of the gospel presentation he makes to the Jewish leaders (Acts 7:1-53). It is so stirring his listeners are "cut to the heart." But instead of letting conviction lead them to believe in Jesus, they resist any notion that He may have been who Stephen says He was. If there was a shadow of doubt in Stephen's heart, it disappears as a result of what he sees next: "the glory of God, and Jesus standing at the right hand of God." Jesus had risen from the dead not long before the events of this story. For several weeks after His resurrection had had made random appearances to His disciples. Then one day "He was taken up and a cloud received him out of their sight" (Acts 1:9). Stephen's sighting of Jesus was evidence to the onlookers then — and us today — that Jesus lives on in heaven. foretold by the prophets (Isaiah 52:13; Daniel 7:14). predicted by Jesus Himself (Luke 22:69). understood by the Apostles (Acts 5:31; 1 Peter 3:22). And every tongue [frankly and openly] confess and acknowledge that Jesus Christ is Lord, to the glory of God the Father." Jesus is so much more than a cute baby in a manger. Has the truth of this sunk in? Do we live "all things have become new" lives that are worshipful, yet hopeful and optimistic because He is exalted? I ask myself, is He exalted in me?